Just released by Transworld Exhibits, Inc. In 2009, the Transworld Convention will be split. The wholesale Halloween, Costume & Party Show will be in Las Vegas, while they are moving the Haunt & Attractions Show to St. Louis, MO. This is no joke, folks! They changed their mind AGAIN!!! Click on the pictures below to see screen shots of the TW sites and read the official press release below the picts. (Northfield, IL) � In an exciting move, TransWorld Exhibits, Inc. announced its decision to move the 14th National Haunt & Attractions Show (HauntShow) to St. Louis, Missouri, at the America�s Center, March 27 � 29, 2009. 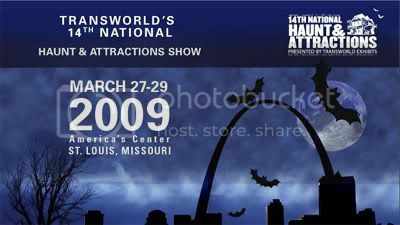 Previously held in conjunction with TransWorld�s International Halloween, Costume & Party Show (HCPShow), the HauntShow will stand on its own in St. Louis, Missouri, giving the buyers and vendors of the Haunt community convenient access to the industry�s #1 trade show in a business environment created just for them. The TransWorld International Halloween, Costume & Party Show will continue to host a Haunt Pavilion as Haunt products are also fundamental to the celebration of the Halloween season and the buyer of Halloween and seasonal merchandise. The HCPShow will take place March 6 � 9, 2009 at the Sands Expo & Convention Center in Las Vegas. Special exhibit packages are available for exhibitors that wish to participate in both the St. Louis and Las Vegas events. For more than 60 years, TransWorld Exhibits has been a leading producer of independent trade shows. The business, which had its roots in the housewares and consumer electronics industry, has over the years expanded its offerings to include general merchandise, Halloween merchandise, giftware, seasonal items, luxury merchandise, jewelry, fashion and accessories. The firm runs trade shows in Chicago, Las Vegas, and St. Louis. For more information on attending or exhibiting, please call 800-323-5462 or 847-446-8434 for international calls. Information is also available at www.hauntshow.com and www.hcpshow.com . I guess it shows that their "extensive market research" and input from vendors and buyers (judging from the responses here, it was both vocal and insistent) indicated that Las Vegas was anything but "convenient access" or a tailored "business environment". St. Louis is certainly central for the bulk of haunts in the country, and TransWorld still seeks to milk the cow as much as possible by keeping a Haunt Pavillion to court West Coast buyers. Will the vendors have the resources to work both shows, or rather than risk the expense before seeing Vegas attendance/order figures will we see a split: smaller West Coast vendors and buyers only populating the Vegas Pavillion, everyone else concentrating on St.Louis or MHC? I must become something black, terrible...a creature of the night. That's it! I shall become a BAT! We'll see how this works out. I really don't see each event attracting as much attention on its own as when they were together. At least St. Louis is a stones throw away. This flip-flopping though is kind of a joke for a major organized event like TW. Ok, what is silly about this is, now we have two shows to go to. Costing us twice the money as it would of before. Not only do we have to go to Vegas, but we have to go to St. Louis. Regardless if you drive to St. Louis, or stay there for the entire show......I am sure gas by that time will be $6 a gallon!! I think Transworld has made another moronic decision. (Hope that was ok to say, as I don't want to get in trouble with the mods here..... ). one think that I"m happy about is that MHC is in my home town. YA!!!!!!!!! time to schedule off of work for those days. A prop a day, keeps the Grim Reaper AWAY!! A prop a day, keeps the Grim Reaper AT PLAY!! The good news is that HauntCon is in Milwaukee this year (a much more manageable stone's throw), which allows us to visit a show that usually costs a great deal (travel expenses) for much less, and actually see a show (looks in the directions of the now vacant Rosemont). And the mome raths outgrabe! sounds super hopefully the wallet will grant me to go on up there. the seminars a pretty good at hauntcon. oh and im an avid supporter miller high life. so it would be worth the trip.